44 John Knox Street, Glasgow. 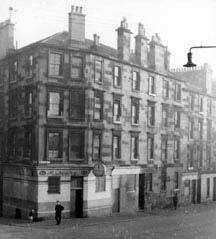 In the late 1800s John Knox Street had four public houses. In 1892 Walter Buchanan owned this old public house, he also traded at 1 Inglis Street at the corner of Bluevale Street. In 1899 Alexander MacKintosh acquired the licence he also had pubs at 56 Barrack Street and 94 George Street. The licence changed hands quite a lot in the early part of the 1900s, Alexander Tinto, then Andrew Symon. During the 1930s and 50s Robert Gordon held the licence he also ran a pub at 728 Argyle Street. Michael Deery took over the pub in 1958, he ran the pub until he was forced to leave when the pub was demolished in the late 1970s. James Deery ran pubs in Bantaskin Street and Garscube Road. In the 1970s he opened the Inn, Lambhill. This old pub was called the Double 4 in the 1973, owned by Michael Deery.